In chapter 5, “The Paradoxes of Christianity,” Chesterton sets forth Christianity as the best explanation of the strangeness of the world: the paradoxical way in which the world is almost rational and orderly – and yet not quite so. He then surveys some of the most common modern arguments against Christianity and notes how they contradict one another: one writer accuses Christianity of being too militant; another of being too pacifist. One writer complains that it is morbidly pessimistic; another, that it is unreasonably optimistic. One writer says that it is inflexible and has not adjusted to the times; another that it is flimsy and adjusts to every time. 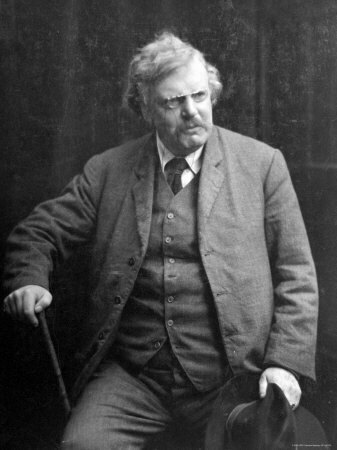 Chesterton suggests that Christianity has been so wildly accused of opposite extremes is because it alone can affirm the strange opposites of the world. It alone allows for both laughter and grief, both love and wrath, both bold enthusiasm for life and care-free willingness to die. It is accused by all extremes because it alone occupies the Normal, the middle ground which can embrace the extremes on both sides of it. This is the thrilling romance of Orthodoxy. People have fallen into a foolish habit of speaking of orthodoxy as something heavy, humdrum, and safe. There never was anything so perilous or so exciting as orthodoxy. It was sanity: and to be sane is more dramatic than to be mad. It was the equilibrium of a man behind madly rushing horses, seeming to stoop this way and to sway that, yet in every attitude having the grace of statuary and the accuracy of arithmetic…. It is easy to be a madman: it is easy to be a heretic. It is always easy to let the age have its head; the difficult thing is to keep one’s own. It is always easy to be a modernist; as it is easy to be a snob. To have fallen into any of those open traps of error and exaggeration which fashion after fashion and sect after sect set along the historic path of Christendom – that would indeed have been simple. It is always simple to fall; there are an infinity of angles at which one falls, only one at which one stands. To have fallen into any one of the fads from Gnosticism to Christian Science would indeed have been obvious and tame. But to have avoided them all has been one whirling adventure; and in my vision the heavenly chariot flies thundering through the ages, the dull heresies sprawling and prostrate, the wild truth reeling but erect.